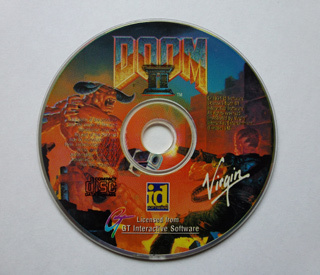 The Doom 2 CD ROM that also includes Doom shareware. 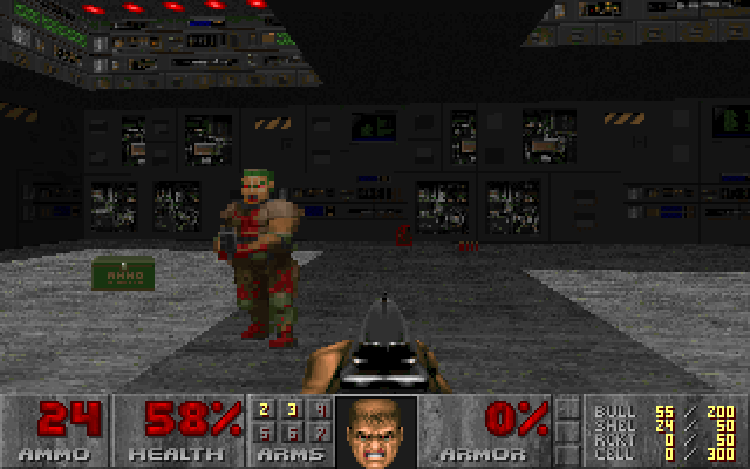 Doom is one of those classic retro games that stands as a milestone in gaming history. 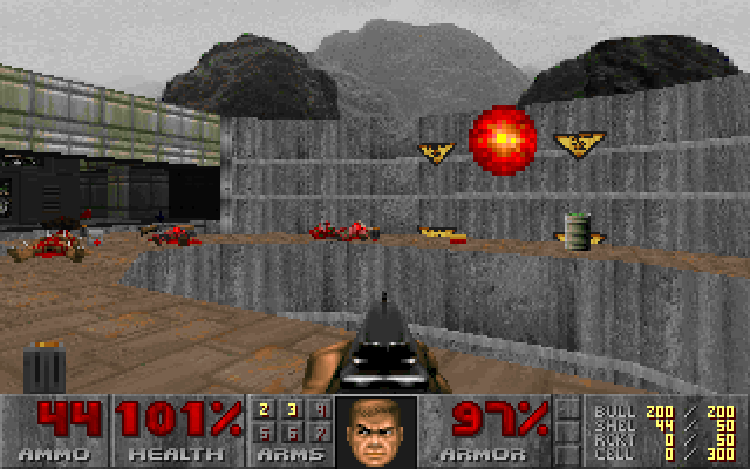 It was the first FPS title to be truly playable and it was free to a PC near you (including at work). 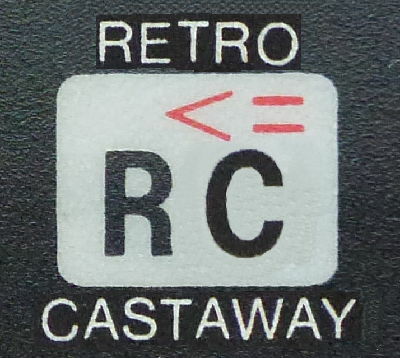 It was also one of the first games to tap into the adult casual gamer market that was soon to be plundered by the all conquering PlayStation. It was controversial in it’s day with brutal violence (all be it in very blocky form) and religious references attracting criticism from more sensitive parts of society. For your average PC gamer however is was pure joy. 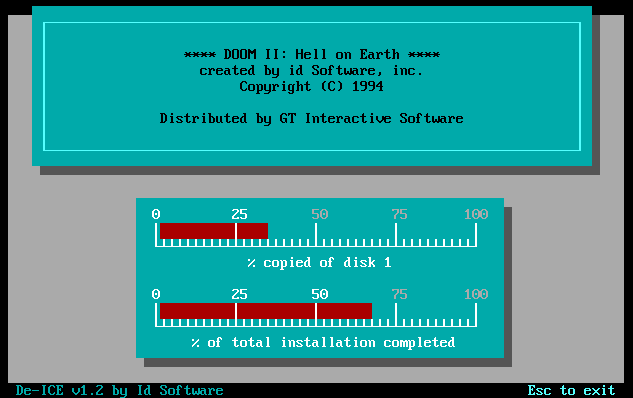 The first level pack was shareware and those that followed, “The Shores of Hell” and “Inferno”, could be ordered via a toll-free number that appeared when you quit the game. Could you direct me to The Shores of Hell please? We’ve got our hands on the CD-ROM of Doom II that contains Doom Shareware so we decided to install it and take it for a spin. 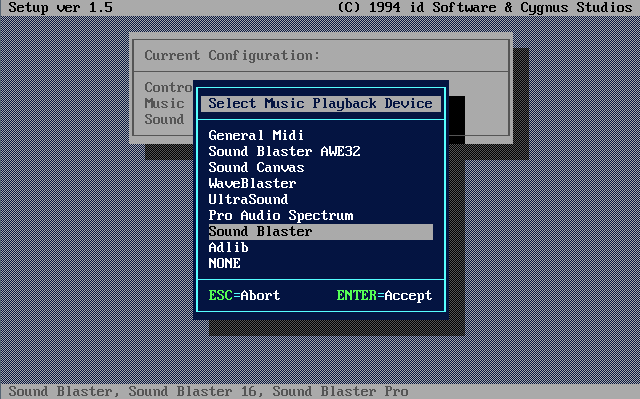 We used the x86 emulator DOSBox to install the game which it did without issue. Doom is installing, get ready for carnage. After the Doom II install screen (that in this case is actually installing Doom Shareware) you get the slightly less informative increasing line of full stops scenario to let you know the progress as your WAD files unpack and install. WAD stands for “Where’s All the Data” and is the package file format Doom uses to hold it’s level data. A thriving community grew up out of the ability to develop custom WAD files resulting in a shed load of modifications including the fantastic Simpsons WAD. In case you’re wondering the Yoshi reference at the top of the WAD install screen (above) is not the long tongued, egg laying dinosaur of Mario fame but Haruyasu Yoshizaki creator of the LHA compression utility used during the installation of Doom. The basic story here is that you’re a soldier and have been sent to Mars to assist in some dimension jumping experiments. Jumping dimensions on Mars sounds like a recipe for disaster and, sure enough, something goes badly wrong. The up-shot is that you’re left as the last man standing facing beasts from the bowels of hell and zombie incarnations of your former work colleagues. Be warned all you Large Hadron Collider boffins at CERN, it could happen. To start your game you can select a skill level starting with “I’M TOO YOUNG TO DIE” and going up to “NIGHTMARE”, we stuck with the respectable middle ground of “HURT ME PLENTY”. You kick-off in “Hangar” the first of 10 levels, it’s a simple affair easily completed using your regulation pistol or your fist on the end of your big hairy arm if you fancy some hand-to-hand zombie bashing. It’s not long before the action hots up and you’re in need of some serious firepower to get the job done. Extra weapons and compatible ammunition can be picked up along the way. First up is the shot gun which makes short work of your zombie colleagues and the fireball throwing angry Chewbaccas that are on your case. Beyond this there are more upgrades to be had including a chainsaw and a particularly satisfying rotary machine gun. This place may look like the inside of your local disco, but it’s not. You wouldn’t get into your local disco carrying a rotary machine gun. The game is still great fun to play and whilst the graphics and sound may not measure up to current standards they do the job in style. Some of the levels can be very tricky to get through and even trickier to find all the secret rooms. 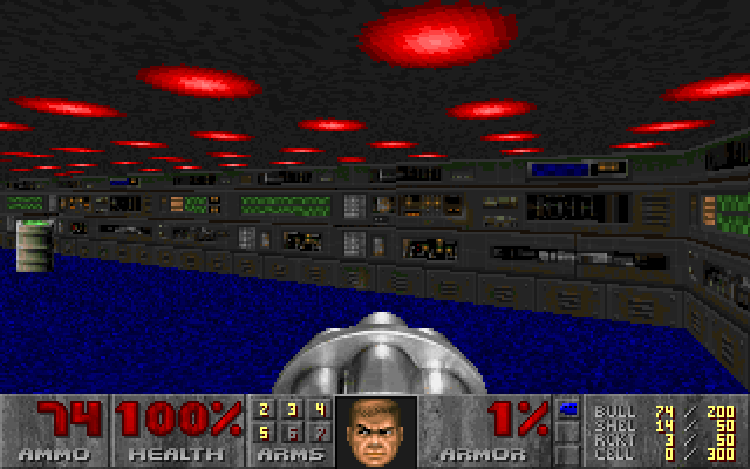 Maps can be picked up along the way to help with this but if all else fails there is The Doom Wiki that contains walk-throughs and loads of other useful information. As you’d expect the Vic 20 version is somewhat limited and not easy on the eye but is a mighty impressive achievement by “Kweepa” the crazy bloke who performed the feat. 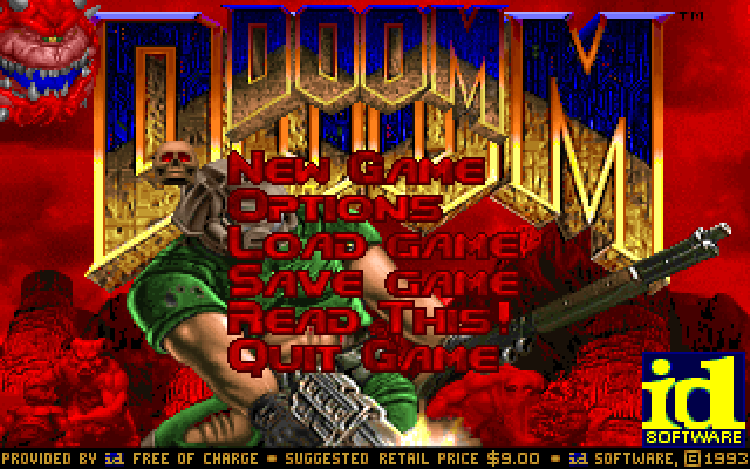 Alternatively, the latest version of Doom was released in May 2016 and is widely available.